I stroked Broccles goodbye, leaned close to his oversized ear and told him I loved him. With heavy heart, I left the veterinary hospital without him, quashing the thought that I might never see him again. The vet promised us an emergency consultation with a specialist who could provide more informed advice. 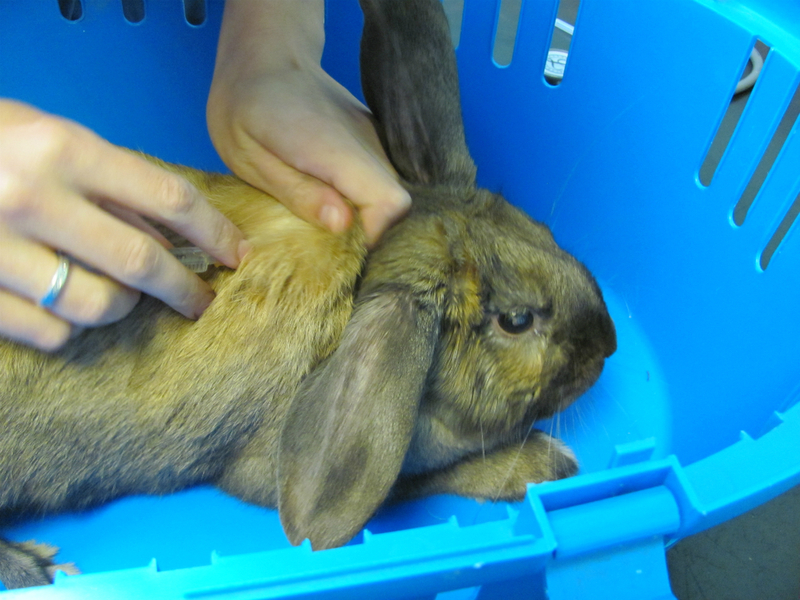 She tracked down an opthalmologist and a rabbit specialist. They were at Glasgow University, and the following morning, Bunty and I collected Broccles and drove straight there. Broccles was dopey from his painkillers and his eye looked awful, but I was overjoyed to see him safe and alive. A clutch of gangly students stood in a semicircle while the rabbit specialist examined Broccles and questioned us. Every so often he made a terrible pun, and the students laughed politely. Then they all trooped off with him to the opthalmologist’s room, where Broccles had his eye checked out. Bunty and I waited edgily in the consulting room, listening to feet passing to and fro outside. I grew increasingly anxious, and by the time the party returned, I was spoiling for a fight. I had a long and pointless argument with the rabbit specialist about what may or may not have caused Broccles’s problem, and what shape his cataract used to be. We drew diagrams at each other to drive our points home. He maintained his good humour and his terrible puns, and answered my every question fully, using the proper terminology and not dumbing it down. He gave me as much time as I needed to vent. The students started to wilt. I asked if Broccles could have a drink, and there was a sudden scramble to action as the students, finally given something to do, all rushed off to fetch him a small bowl of water. He drank some, and tossed his ears perkily at them. I began to feel hopeful. The upshot was that Broccles’s lens had ruptured and his eye needed removing, but to remove it safely the swelling had to be reduced. The specialist prescribed a pharmacopoeia for Broccles. He was pleased when I chose injections over oral dosing. “Oral dosing can unduly stress a rabbit,” he opined. Certainly, Broccles goes into a wild panic when his mouth is fiddled with. 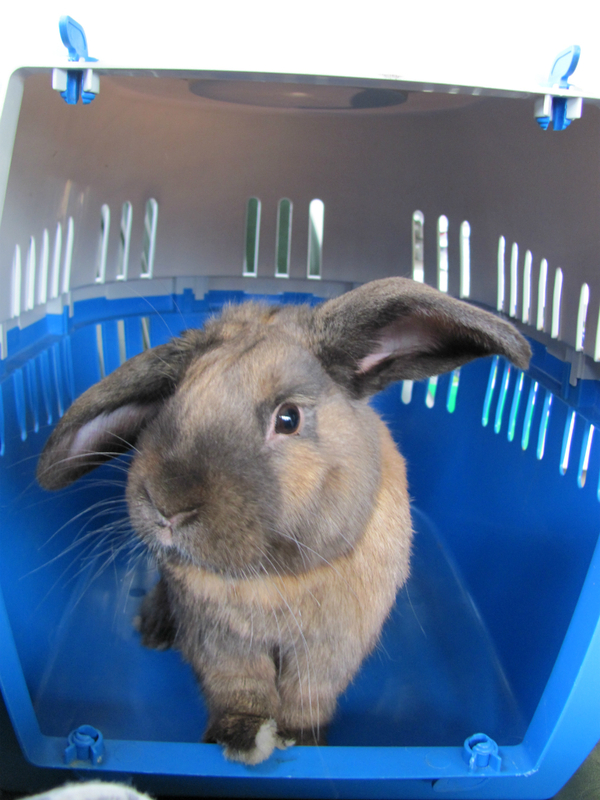 The specialist told me I could buy the medications there at Glasgow, but I would save money by buying from my own vets. He called them to make sure they had them in stock, and we stopped on the way home, to pick them up. There had been a miscommunication. They didn’t have all the meds. They only had the antibiotic – the oral version. Dosing Broccles with it was a punishment for us both. In two days, he had had only a few mouthfuls of food and water, and now he was putting his last ounces of strength into fighting me when he should have been resting. It made me weep. I had nothing to give him for the pain. For most of the night, he sat upright on the hearth, his body rigid, his ears set in a Y-shape. He has lop genes, and his ears normally stick out sideways like aeroplane wings. Every so often, he visited his food bowl or the array of salad I had laid out for him, tried to nibble, and gave up. His droppings were becoming infrequent, tiny and black. Then they stopped altogether. Googling told me that this is a very grave sign indeed: if his digestive system stops moving, a rabbit can die in a matter of hours. At 5 a.m. I called the emergency vet for advice. She had not treated Broccles, but she had heard the other vets talking about him, and so she knew who I was without asking. She told me that how long a rabbit takes to die from not eating depends on the rabbit, but that I could try feeding him water and liquid food with a syringe. (Oh please, not that!) She offered the thought that, with his condition, he might die anyway, regardless of appetite. As forms of reassurance go, that was the worst I’d ever heard. I forced a syringeful of water into him, and sat with him until the surgery opened. “I’m sorry I wasn’t available when you came for his medicines”, said his usual vet. She provided me with everything Broccles needed, all in syringes for me to inject. I was missing just one medicine: anti-inflammatory eye drops. It was such a relief to have painkillers for Broccles. 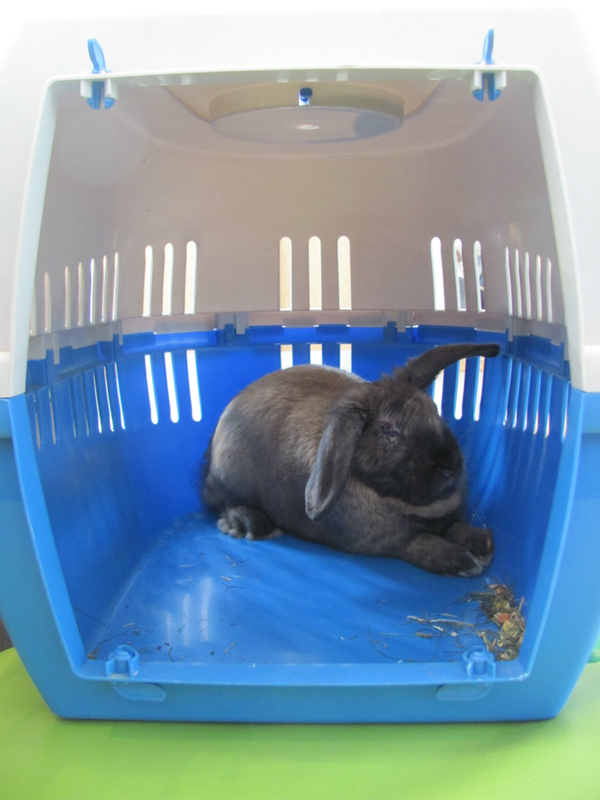 Fifteen minutes after a dose, his ears went floppy and he stretched out on the floor. We plied him with every kind of food we could think of, in the hope that he would try something. Eventually, when I brought a birch branch into the house, he immediately began to eat the leaves off it. Interestingly, birch leaves contain acetylsalicylic acid, the precursor to aspirin – an anti-inflammatory. With the eye drops, everything changed. The swelling went down. He stopped needing painkillers. He started eating, and frolicking after the cats, and playing in the garden. At each of his subsequent check-ups, the vets were astounded. “I never would have believed it”, they kept saying. The receptionist began to recognise me and greet me when I arrived at the surgery. I sat there giggling to myself for a long time. The receptionist was embarrassed, but I liked being called Mrs Broccles. Provided you don’t fiddle with his mouth, Broccles is the perfect patient. I would show him his medication, tell him it was time for his injection or eye drops, and he’d lie down with his chin on the ground and let me dose him. Yesterday was his fourteenth and last eye consultation. 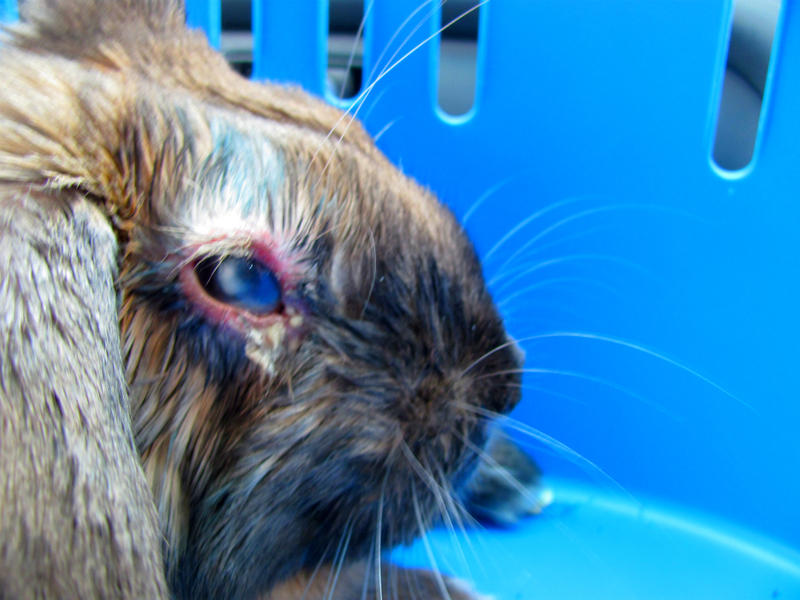 An examination showed no sign of abcess, infection or ocular pressure: it is as healthy as it can be. He will always be blind in it, but he won’t need it removed. Here he is getting his booster vaccination for myxie, with happy aeroplane ears and a small ghost in his eye. I still can’t get over those ears. so warm. . . and he seemed to love having them stroked. So sad to hear about his ordeal. . .
I’ve been stroking his ears a lot more since you showed me how much he loves it. I’m SO glad Brockles is ok, when I read the first line I feared the worst. What a releif when I read to the end. Thank you! I’m sure you have a very good idea how relieved we are. Oh, I thought that something horrible had happened overnight that this was all new. Thank you for sharing. I really needed to be reminded that Broccles is very dear to me despite having never met him. I’m so glad Broccles in doing better and what a terrible scare for you and Bunty. Yay, the happy ending! Wasn’t expecting that. I wouldn’t dare to presume! Besides, they can find me online. Thanks for the vote of confidence, though! Heavens above! He’s really been through the mill, hasn’t he? I’m convinced that without you two’s care and empathetic attention, Broccles would simply have turned his face to the wall. I wonder if that phrase means the same as it did when I was a kiddie. It seems you have another yogabhrashtra on under your wing! It strikes me that Gerald Durrell fits the yogabhrashta profile; what do you think? Poor Broccles- so glad he has pulled through again, He has had far too much of the things that bunnies shouldn’t have, How you managed to study and carry on an internet court case with a loony is beyond me. Hugs to all & pats & strokes where appropriate! We only have colds! Poor little guy. I’m happy he pulled through. Thank you. He is a trooper. We get various hawks in this area, but rabbits are too big for them. The biggest hawks we get are red kites, which have a wingspan of around five and a half feet. They’re endangered, because farmers used to shoot them on site, thinking they ate lambs and such. There’s a big educational drive here now, which has taught me and others that a baby rabbit is the biggest thing those hawks can lift. Foxes are the greatest threat to our pets. We are lucky enough to have a walled garden, which keeps them out.